Alzheimer’s Walk participants braved a steady rain Saturday in Greenville to promote awareness, and provide support and hope to those living with the debilitating effects of Alzheimer’s and dementia. 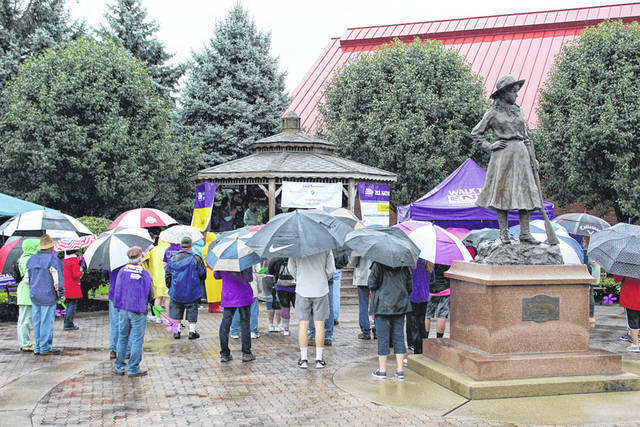 GREENVILLE — Raindrops did not deter those seeking a cure for Alzheimer’s Disease and dementia as the Miami Valley Chapter of the Alzheimer’s Association held its 2018 Walk to End Alzheimer’s Saturday in Greenville. The Walk to End Alzheimer’s is the chapter’s largest fundraiser and awareness event. The Alzheimer’s Association is the nonprofit leader in research, but also offers local care and support services for those affected. Its goal is to find a treatment and eventually a cure for Alzheimer’s. “People join us for all different reasons, and during our Promise Garden ceremony everyone receives a flower that showcases our reasons for walking,” said Coordinator Máire Reynolds. “Those who carry the orange flowers do not have a personal connection, but support the vision of a world without Alzheimer’s. Those who carry the purple flowers have lost someone to Alzheimer’s or dementia. Those who carry a yellow flower are the caregivers who care for someone living with Alzheimer’s or dementia. Those who carry blue flowers are living with Alzheimer’s or another form of dementia. Reynolds said the event was expecting about 75 to 100 participants, who gathered at Annie Oakley Park at 10 a.m. A Promise Garden Ceremony was held and then the walk itself. Kathy Galentine of Englewood, and formerly of Greenville, was one of those who participated in the walk. She lost her mother to vascular dementia in 2016. As such, she carried with her a purple flower in remembrance. “It’s amazing what this organization does, and bottom line, I’m walking so one day, hopefully, we get to that white flower which means we have the first survivor of Alzheimer’s,” she said.